I hope that you are having a great week. My week has been a little hectic. Our oldest son has started college, and our two younger children are starting school next Tuesday. The youngest had walking pneumonia but is on the road to recovery. However, the poor thing is having oral surgery next week. He hasn’t been able to lose his baby teeth, and it seems that he was born with some extra teeth. He is going to have a couple cut out and a few pulled. I know that this is a minor surgery, but I am one nervous Momma! Before we get to today’s topic, I would like to thank each and every one of you for reading my blog. To all who have subscribed or just stopped by to read my posts, I want to thank you. You have been so kind and supportive of my new blogging adventure. I treasure your very sweet and supportive comments, and I will never forget your kindness. I have been blogging for over two months now, and I am looking so forward to what the future brings. Now for today’s topic…adding style and character to a small space. Decorating small spaces are a problem that many of us face, and what better place to show how to apply this principle than with my very small dining room. My mantra is to love the space you are in and work with what you have. With these decorating tips, a small space can still be special. Decorating tip number one, just because a space is small doesn’t mean that you should decorate it with small things. You need a couple of big impact items. One that comes to mind in my dining room is the chandelier. When we moved into the house, we replaced the light fixture with a larger chandelier that fits the style of our decor. It really makes a dramatic impact in the room. The second decorating tip involves working with what you have. It is not in the budget right now for me to update my dining table. I have had it for awhile. To give it an updated look at an inexpensive cost, I simply purchased some fabric and recovered the chairs myself. The fabric I chose also helped to bring some color into the room. I added blue tassels to the end chairs for a little French flair. A third and very important tip is that a beautiful rug can do so much for a small space. It creates an anchor for furniture, adds color, or just softens a space. My dining room would not allow for an area rug. It was too small, and the corner window was angled cutting into the floor space. Therefore, I decided to put a subtle patterned carpet in the space. My home is basically an open concept plan, and we just put wood flooring throughout the downstairs. I chose to put this patterned carpet in the dining room to give the area its own defined space. The fourth decorating tip for adding style to a small space is do not forget the walls. Choose artwork, sconces, mirrors, architectural pieces, iron, or even plates to adorn your walls. This painting is on the end wall of my dining room. It has a lot of pretty colors that are reflected throughout the house. I placed a mirror and sconces with accessories on one side wall. On the opposite wall, I did a platescape. I love to decorate with plates! The fifth and most important decorating tip is don’t forget to accessorize! Accessories are so important in making a house feel like a home. They are like the frosting on the cake and can give a room so much character! For my dining room table, I had a beautiful faux floral arrangement made by a very talented floral designer. This helps to tie the colors of the room together. I want to take a moment to address using faux florals in design. A lot of individuals do not agree to the use of faux florals. However, I strongly disagree. It is not always feasible to have fresh flowers every day in your home. There is nothing wrong with using faux flowers as long as they are tastefully done and realistic looking. I chose to place my arrangement on a beautiful floral table runner. The antique china cabinet sits in a corner of the room opposite the angled arched window. No house is perfect. We are all living with spaces that can sometimes be difficult to decorate. I hope that some of the decorating tips I have shared with you today will be of some help for decorating your space. I want to thank you again for taking the time and sharing a part of your day with me. I am so humbled by the kind comments and support I have received. I hope that you have a wonderful and blessed day!!! You are such a sweet, talented person. I wish I had just a fraction of your talent. You are so kind to share your beauty with us. I waited, almost with bated breath, for your post today. Marsha, you are too kind! What a very sweet thing to say! I am so flattered by your thoughtful comments. Thank you so much for reading my blog, and I hope that you have a wonderful rest of your week!!! I am so sorry about your child being ill, that can rapidly take the wind out of mom’s sails. My son was a very sickly child, (he looked like the picture of health) but was in hospital for pneumonia about 6 or 7 times and also had Rocky Mountain Spotted tick fever while my husband was in the Mediterranean. You talk about a frightened mom, that was me! He is over 50 ow and has blessed me with grands and great grands. My daughter was born with a heart defect, so I was always anxious about her. It’s a wonder I didn’t lock them both in a padded closet! SHE has also blessed me ( and almost caused me to have heart failure) with 4 grandchildren and a great grand child. So know “I feel your pain”! Thank you Marsha. He has had pneumonia a few times along with whooping cough when he was two months old. Both he and my daughter were born with problems with their immune systems. When my daughter was born, I had to quit work to take care of her because she couldn’t be around other children because she caught everything. She seems to be doing a lot better the older she gets. We just have to be careful when she gets sick. You are so fortunate to be blessed with beautiful grands and great grands. What a blessing! I can also tell by your kind words that you must be a wonderful mother and grandmother. Thanks for this wonderful edition! Your pictures gave me some wonderful ideas for my space 🙂 Your blog is awesome and always enjoyable to read. Hi Laura! Thank you so much for your very kind words! I’m so happy and flattered that you find my blog enjoyable to read! I hope that you have a blessed and wonderful day!!! Shannon, you shared some great tips in this post! I love how you have beautifully incorporated them into your dining room. The colors and styling are lovely! Shenita, thank you for your very sweet comments. Your tablescape this morning was gorgeous! You have such a beautiful home, and a wonderful decorating style! I hope that you have a Happy Wednesday!!! Your dining table and chairs are so pretty and I especially like the blue fabric you used to recover. Thank you so much Connie for your very sweet comments! I’m so happy that you stopped by for the tour, and I hope that you have a wonderful and blessed day!!! I’m enjoying your blog, and I pray your son will sail through the oral surgery with no problems. Your dining room is lovely, the blue seat covers and tassels on your chairs are the perfect touch. And I’m in LOVE with your corner china cabinet and all the transferware inside. I personally would rather not have artificial flowers in my home but I know many people do like them and that’s fine too. It’s just “me.” Beautiful colors in yours and in the runner beneath. Thank you so much Joy for your very kind and sweet words. I’m so flattered that you are enjoying my blog! I’m so happy that you stopped by for the tour, and I hope that you are having a wonderful week!!! Thank you so much Shelia for your very kind comments! I enjoyed your post this morning on Shirley’s blog. You have such a wonderful decorating style. I hope that you are having a wonderful week!!! Pam, you always leave such sweet comments. 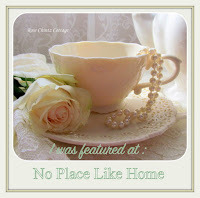 I love reading your blog, and your home is beautiful. Thank you for always being so kind! I hope that you have a wonderful rest of your week! Shannon, you have such a pretty and warm dining room! I love the blue fabric in your chairs as it brings so much vitality to your dining look along with all your other pretties. My daughter had to have her baby teeth taken out as well as they wouldn’t come out on their own. She was fine and I know you will be relieved for your son’s visit to be done. Jan, thank you for the very kind compliment, and thank you for the extra reassurance about my son’s oral surgery. I hear that there are several children out there who are born with extra teeth. I wanted you to know that I enjoy reading your blog, and that you have a beautiful home. I’m unable to comment on your posts. I’m not the most computer savvy person in the world and can not figure out how to leave comments on certain blogs. I just wanted you to know that I enjoy reading your posts. I hope that you have a safe and happy holiday weekend! May I say “amen sista” to the comment about faux flowers?! I use faux flowers for several reasons. Number 1 is allergies. I do love a big bouquet of fresh flowers, but they do no always love me. Number 2 is cost. Fresh flowers can be expensive! Your decorating tips are spot on. I love your dining room! It looks like a cozy place to eat and enjoy talking. Hi Linda! You have some very good points regarding faux flowers. Plus, there are so many realistic looking ones today. You can hardly tell that they aren’t real. Thank you so much for your very sweet comments. I hope that you have a wonderful holiday weekend!!! Very beautiful dining room set; specially the chairs. I don’t have faux flowers, but thinking to buy some gorgeous hydrangeas I saw the other day in the store. Lovely display in your curio cabinet too. Hi Fabby! Thank you so much for your very sweet comments! I hope that you are having a wonderful holiday weekend!!! Shannon, I love all the charming touches in your dining room. You did such a lovely job using what you have. I hope your little guy gets through his surgery well. A momma’s heart will always be a momma’s heart and she hurts for her children no matter how old they are. Thanks for sharing and have a splendid day. Thank you so much Sandi for your very kind and thoughtful words. I know that he will be all right. I hear that it is a very common thing to happen to little ones. I just wish I could do it for him so he wouldn’t have to. Thanks for allowing me to be a part of your party, and I hope that you have a wonderful and blessed day!!! You have a lovely dining room and I love all those windows in there. I love a lot of natural light and your room looks like it get’s plenty of light. Thank you for sharing these great tips on small spaces at Dishing it and Digging it link party. We love having you. Thank you so much Vanessa for your very sweet and kind comments. My house does have lots of natural light which helps a lot. I’m so happy that you stopped by, and I hope that you have a wonderful week!!! What a pretty dining room. I know we don’t use them so much anymore but I do enjoy looking at the elegance a dining room gives a house. Thank you so much Debra for your kind comments. I’ve been noticing a lot of the new houses being built today do not have dining rooms. I love a dining room. I wish mine were larger, but I’m thankful for the one I have. I’m so happy that you stopped by, and I hope that you have a Happy Tuesday!!! Those chair tassels add such a nice touch! Thank you for sharing with us this week at Celebrate Your Story, have a great weekend! Hi Sandra! I’m so happy that you stopped by. Thank you so much for allowing me to be a part of Celebrate Your Story. I really appreciate the opportunity. I hope that you have a great weekend too!!! Thank you Cindy! I hope that you have a wonderful and blessed Sunday!!! Louise, I am so happy that you found my blog. Thank you so much for your very sweet and kind comment. My dining room is very small, and has an angled window. There was no room for the proper size of area rug so I decided to go with a patterned carpet. I also put the same carpet on my stairway. Again, thank you for your kind words. I hope that you are enjoying your weekend! The weather is crazy here in Oklahoma. It is almost 90 degrees! It makes me ready for Spring!